Find and compare the best prices from a range of well known car rental companies at Rzesów-Jasionka Airport. This is a free to use facility, enabeling you to book direct with the company quoting the price. Rzeszow airport has a modern passenger terminal, opnened in 2012. A regular public bus service runs from the airport to Rzeszow at a cost of approximately 3PLN and a shuttle bus connects the airport with the city bus and railway stations at a cost of 8 PLN (approximately 1.60 Pounds) per passenger with luggage. 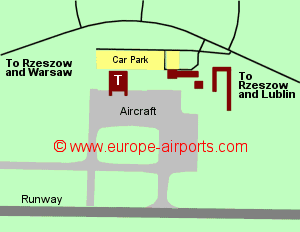 Rzeszow airport has 2 bars/cafes/restaurants, 3 shops, ATM, currency exchange, VIP room, meeting rooms. 693,000 passengers were handled by Rzeszow-Jasionka airport in 2017, a 4% increase fron the previous year, and the busiest year yet.